Our confrere Angelus M. Shaughnessy, OFM Cap., passed to the Lord's eternal life on Friday, March 2, 2018, in his 89th year, after more than 67 years in vows as a Capuchin friar and 62 years a priest. He was preceded in death by sisters Mary Elizabeth (Roth), Sr. Mary Cecilia (Anna Mae) CDP, Irene (Murray), Pauline (Adams Cucinelli) and Josephine (Laman), and by brothers Fr. Sigmund (John Joseph) OFM Cap., Paul and Joseph. He is survived by sisters Regina (Sykes) and Bernadette (Higgins), and brother Bernard. Matthew Edmund Shaughnessy, fourth son and ninth child of John and Anna (Spang) Shaughnessy, was born on November 16, 1929, in Rochester, PA, and baptized at St. Cecilia Church by Capuchin pastor Fr. Hugh Rauwolf, OFM Cap., on November 24th. 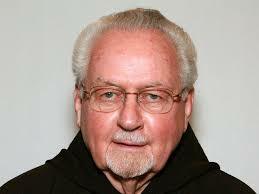 After attending St. Cecilia Grade School, he entered St. Fidelis College and Seminary in Herman, PA in 1947. A talented and capable athlete in his youth, Matthew turned down an offer to play professional baseball as a left-handed pitcher for the Cleveland Indians to enter the Capuchin Novitiate, where he received the religious name Angelus. On July 14, 1950, Angelus professed his vows as a Capuchin Friar, making his perpetual profession three years later on July 14, 1953. After receiving a Master’s Degree in Religious Education, Father Angelus was ordained a priest by Bishop John McNamara on June 4, 1955 in the Crypt Church of the National Shrine of the Immaculate Conception in Washington, DC. In his early years as a priest, Angelus served as the "Director" of the Secular Franciscan Order while directing retreats in the Pittsburgh area. In October of 1966, Father Angelus volunteered to work as a missionary in Papua New Guinea (PNG). For the next 12 years, Angelus was spiritual director and teacher at the newly erected Saint Fidelis Seminary on the northern coast of the Madang Province. In 1978 he was transferred to the Mendi Diocese in the Southern Highlands Province, and for the next two years did pastoral work among the people there. During the course of his ministry in Papua New Guinea, he worked with his friends and parishioners in building 11 permanent churches and three bush churches. While ministering to the needs of the people of PNG, Angelus would often say how proud he was to have presided over the baptisms of 1,227 men, women and children. In the summer of 1980, Father was reassigned to his home territory of Western Pennsylvania. Under the auspices of St. Fidelis Retreat Center, he conducted many parish missions and renewals, preached and directed retreats, accepted parish help-outs, days of recollection and appointments for personal individual counseling. Many remember him for the six years that our brother was visible on the Eternal Word Television Network in Birmingham, Alabama. There he served as Minister General for the emerging community of the Franciscan Missionaries of the Eternal Word. He was happy to be a part of the apostolate at the network where he was able to become a familiar voice and presence to millions. Our brother was blessed with many devoted and helpful friends. His interest in the spiritual life led many to seek him out for spiritual guidance. He loved being in the company of his friends and family, who were always ready to attend to his needs. In his last days he preferred the company of his visitors to the easement of his pain, forgoing medication so that he would be able to converse with those who came to see him. May this faithful servant of Christ now take his rest in the eternal fullness of the hundredfold, the taste of which so delighted him in work that only Sister Death could part him from it. with the Vigil Service at 8 PM. We are grateful for the life of our brother Angelus. As he set out to fashion himself a model for the friars who would come after him, please know that any gift to our Capuchin brothers in his memory will help in the formation and education of our young friars and in our care and attention to our senior friars.